2018 Purple Time Rift Competition: Final results! 2018 Purple Time Rift Competition: 2nd place announced! 2018 Purple Time Rift Competition: 3rd place announced! Kickstarter goods are out! NEW MERCH STORE!! Gears for Breakfast is excited to announce the opening of our official Merchandise store!!!!!!!!!!!! Gears for Breakfast is pleased to announce a free update to A Hat in Time: The Modding Update! Announcement! A HAT IN TIME LIVE ORCHESTRA on August 16th-18th in Copenhagen, Denmark! ACTION REQUIRED: Update your shipping address before January 10th! LAST CHANCE! A Hat in Time AVAILABLE NOW worldwide on Playstation 4, Xbox One and PC! A Hat in Time is now available worldwide on Playstation 4, Xbox One and PC! Click here for a list of storefronts to purchase the game. A Hat in Time is releasing Dec 6th for Xbox One and PS4. That's right, next week. Digital only, via Xbox One and PS4 store. Price: $29.99 USD. Need assistance? A Hat in Time Help Center now available! Thank you everyone who participated in the 2017 A Hat in Time Speedrunning Event! A HAT IN TIME release info for backers & slacker-backers! Hello backers and slacker backers! A Hat in Time is being reviewed extremely positive. The first review to come in is from Destructoid, who gives it an 8.5/10. A HAT IN TIME is out NEXT WEEK (Thursday, Oct 5th) on PC! Speedrunning Event ends tomorrow! A Hat in Time releases October 5th - in 14 days!! Hey everyone!! It's finally happening!!!!!! A Hat in Time releases on October 5th! 2017 A Hat in Time Speedrunng Event - now live! Quick update on Upgrade-to-Console options! Hello backers and slacker-backers, and all the fans who have met us at Gamescom so far! ANNOUNCEMENT: A Hat in Time coming to PS4 and XBOX ONE this Fall! A Hat in Time is arriving on Windows, Mac... and now PS4 and XBOX One THIS FALL! New official A Hat in Time Discord server! Talk to the devs! [ACTION REQUIRED]: Check your reward address is correct! LAST CHANCE! Last chance to become a slacker-backer! Hello Kickstarter backers and slacker-backers! Earlier this month we published our E3 2017 trailer. If you haven't seen it, please go check it out! Cute and Quirky 3D Platformer, A Hat in Time, On Display at The MIX LA, June 14th! “Murder on the Owl Express” E3 Gameplay Trailer Debuts, Level to be Hands-On at the Show! A Hat in Time announces Fall 2017 release date, new trailer: Murder on the Owl Express! Introducing Chapter 4: Sand an--, actually, ALPINE SKYLINE! New gameplay footage at PAX East 2017 live, tomorrow Mar 11th 11:30am! NEW TRAILER: Chapter 3 - Last Bird Standing! How A HAT IN TIME is made: Game Design LIVESTREAM -Today, Nov 12th! Today, Saturday November 12th, at 6PM GMT+0 (click for your local time) we'll be doing a game design livestream over at Twitch.tv/MekuCube! How A HAT IN TIME is made: Game Design LIVESTREAM - Saturday, Oct 15th! Development Status, Release Date, Kickstarter Goods and Update Mega-Post #3! IMPORTANT: Physical reward tier surveys have been sent out! Hey everyone! We've sent out the physical reward tier surveys for the Kickstarter rewards! It's really important that you answer the survey before the deadline: July 1st. Introducing: LARGEST MUSIC UPDATE to date! Hey everyone! We've just published our second sneak peek, this time of Chapter 2: Subcon Forest! Official Boxart! Hat Kid's Scooter! Time Rifts! 2015 Round Up! Reminder: Design-a-Hat reward tier deadline is Oct 10th! Progress Update! Cracking open the last regular chapter! Just a small notice that we delivered all the beta keys Monday. A HAT IN TIME's BETA BUILD launches TOMORROW! 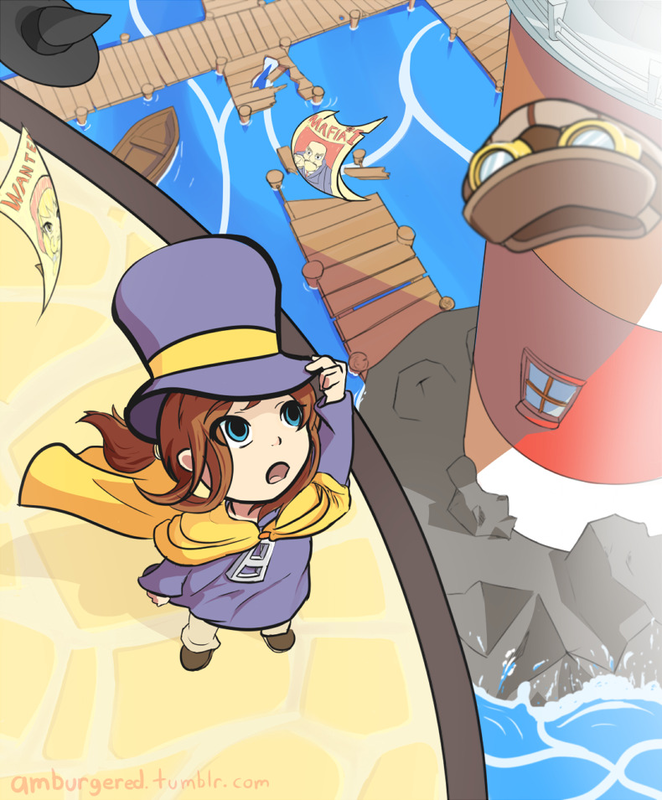 A HAT IN TIME's BETA BUILD launches TOMORROW for backers and late-backers! Beta Build releases March 7th! MEGA update! It's mega! So big! If you backed the Kickstarter up to the $70 Alpha tier, then you'll be receiving our Alpha Build on Feb 20th! Hello! This is Jonas from Gears for Breakfast. Hi, this is Jonas from Gears for Breakfast. Queen Vanessa' is one of many levels in A Hat in Time's many chapters! Don't get too spooked!! What IS a Subcon Forest? Mini update: New Mafia Town screenshots! Chapter 3 "Trainwreck of Science" screenshots! Blog post: Chapter 3 content creation begun! Slacker Backer preorder option now available! Paypal support! Hello hello! This is our first month working after the Kickstarter, and we’re calling it Queen Vanessa month! We at Gears for Breakfast would thank you so much for an amazing ride!! We hope to be able to provide you with a great gaming experience soon! 2 New Kirkhope tunes! Greenlight! ALL GOALS DOWN! Grant's Music Madness! 2 goals down, 1 to go!! New Game + and Voice Mumble! Kickstarter exclusive hat winner! JoshJepson playthrough! LAST WEEK! Hat Kid figurine! Grant Kirkhope tune! Video Games AWESOME's video now online! Enjoy some sweet gameplay and some sweet costumes from Fraser and Becky from Video Games AWESOME! Chapter 2 Peek, Physical box! Hat Kid's Spaceship! SpilBar showcase, shirt winners, VGA's stream, Buttons! A Hat in Time showcased at the Danish SpilBar event! Kickstarter exclusive hat voting! Also more hats in stock! All pledges $40 and above now also get the Kickstarter hat! Woosh! Down goes another stretch goal! Next: Grant Kirkhope tune! Wow, $110,000! You guys have just succeed in getting a 7th chapter for the game! Well done - thanks a lot! Full voice acting reached!! Vote on T-shirt designs! A Thank You from the Mafia of Cooks! Thank you for giving us the opportunity to add more life and character into our cast!! New Stretch Goal: Grant Kirkhope song (Banjo-Kazooie Composer)! 6th Bonus Chapter Stretch Goal Unlocked! A Hat in Time: Official Source Filmmaker pack! Thank you everyone for backing! 200% of goal reached! Music! Virtual-only reward tiers! We've reached 200% of our goal! Co-op + Developer Commentary reached!! Co-op and developer commentary stretch goals reached! A Hat in Time has been funded! Thank you all so very much! Wauwsa - this is crazy! WOW WOW WOW WOW!! What a day, what a day!